Egypt is a place of Gods and Kings, of mysterious history, and cultural experience. Of political upheaval, and romantic adventures, Cairo, Egypt, is the second-largest city in Africa. In fact, it is the largest city in the whole Arab world. Cairo is derived from the Arabic word al-kahira, meaning “the strong”. Residents outside of Cairo refer to Cairo and Egypt as “Misr”. This custom of reference as “Misr” dates back to early history in Cairo. Egypt is famous for the Giza Pyramids and the great Sphinx, yet Cairo holds much of famous history within the city. Medieval architectures and a modern day city harmonize together in a culture unlike any other. Cairo preserves, decorates, and celebrates Egypt’s history in true form. Cairo can be traced back to the early 4th millennium BC at the head of the Nile delta, in a place of the Egyptian capital of Memphis. It was here that the city was spread along the banks of the Nile, allowing the Romans to construct their famous city, Babylon . Muslim Arabs immigrated to Cairo from the Arabian Peninsula in 641 AD, calling their site ‘Al Fustat’. In 969 C.E. New Cairo was built north of the old one called Khere-ohem, which meant “place of combat” taking it from a battle between the gods, Seth and Horus, that mythically took place there. Located on the edge of the Nile River, Cairo is a city of the Middle Ages, city of Egyptian dynasties, and a city with a thousand years of history. In the 12th century, Cairo was attacked by Christian Crusaders, but the Syrian Muslim army led by Saladin, defeated them. Under the Fatimid dynasty the most important Islamic mosque called Al-Azhar was built until it was burned to the ground during Crusader attack in 1168 C.E. The Citadel, one of the most famous landmarks in Cairo, was established under the rule of the Ayyubid dynasty in 1171 C.E. after Saladin’s (Salah al-din) army defeated the Crusaders. It was at this time that Cairo became established as the economic, cultural, and political hub of Egypt. The dominance of the Mamluks made Cairo into a world-renowned place with the spice trade, and prosperity followed. Cairo declined after the Black Death (bubonic plague) hit the city, rapidly destroying its population. This pandemic hit Cairo more than fifty times between 1348 and 1517. The population of Cairo was reduced down to only 300,000 people. The Black Death is caused by oriental fleas which live on black rats. In 1798, the area was captured by Napoleon of France as Cairo was under the Ottoman rule. The weakness of the Ottoman Empire opened Cairo to great influence from Europe. Many European-style structures were built in the city by the Viceroy, Ismail Pasha, who ruled until 1879. Development during this period was in totality, funded by foreign loans. This European power exercised its rule by opening the Suez Canal north of Cairo. This is how the British came to effectively rule Egypt from the 19th century all the time through after the First World War in 1914. Urbanization and massive immigration defined the 1800s in Cairo after Muhammad Ali’s rule of Cairo ended in 1850. From this point on, Cairo had continued fast acceleration in population growth; a population exceeding 17 million today. Some population growth was due to the influx of refugees from all the cities located along the Suez Canal which was terribly damaged in the Arab-Israeli wars during the late 1960s and early 1970s. Tourism has proven a dominant source of foreign revenue for Egypt, resulting in a heavy investment from the government. The Arab League, founded in 1945, has made Cairo a political capital along with Egypt’s participation of the Middle East peace talks. Sadly, the city witnessed a horror in 1981, when Egyptian President Anwar Al-Sadat was openly assassinated by Islamic fundamentalists at a military parade. Cairo has inevitably risen to the top as a center for publishing and media. In 1875, Cairo’s newspaper, the Al-Ahram, was founded and then in 1952, Al-Akhbar. Both exerted a huge influence on the Islamic world, along with Radio Cairo. The vibrant culture of the Egyptian people has enhanced this influence through local cinema, theater, dance, and music. Nobel Prize winning author, Naguib Mahfouz is a native resident of Cairo whose fiction has provided an detailed chronicle of this magic city. Cairo contains thick cultural history in every turn. Located in downtown Cairo is the plaza center known wordwide as “Tahir Square”. It was during the year 2011, the world witnessed a ‘peaceful revolution’ brought on by the youth raised in poverty. They took over Cairo’s streets with demands to change the country’s 30-year dictatorship by Muhammad Hosni El Sayed Mubarak, the fourth president of Egypt. History was made as the world watched the Egyptians go forth in nonviolent demonstrations. Tahir Square is home to the Egyptian Museum, home to kings’ treasures and mummy rooms. Across the historical Qasr al-Nil bridge are boats decorated lavishly with lights, colors, and music to welcome visitors for a night ride down the scenic Nile River. Coffee houses (ahwas) and golden shops scatter all through downtown, offering a spectacular sense of traditional culture. "...manifold combinations of light and shade, color, costume and architectural detail every shop front, every Street corner…is a ready-made picture." Amelia B. Edwards describes the streets of Cairo, 1877. Little narrow streets give smells of musk and amber, offering up cultural warmth in people and old architecture. The open-air markets sit on the main street called Shar’a Mu’iz which has been around since the earliest dynasties. This street is traditionally named Al-Mu’zz li-Deen Illah, and is known to contain the largest concentration of historical buildings in the Islamic nation. Stretching from Bab Al-Futuh across the street to Bab Zuweila, is over fifty-five medieval landmarks, and mosques. In between historical buildings are well-preserved palaces, spice markets, and antique shops. This mesmerizing part of Cairo is considered as an ‘open-air museum’. South of Cairo is known as the ‘garden city’. Embassies and expensive homes line this area, but the most impressive medieval fortress of all time sits on top of a hill here. Salah El-Din Citadel, the most popular attraction in Cairo, second to the Giza Pyramids. Egyptian rulers had occupied this mesmerizing, jaw-dropping palace-land for over 700 years. Built between 1176 and 1182 AD, this fortress provides a panoramic view of all of Cairo from the Mokattam Hills. Outbuildings and exterior castle walls all hold powerful secrets and clues to life of kings in the Citadel. The alabaster's pillars and courtyard are breathtaking; as is the tomb of Muhammed Alli Pasha. On a clear day, the Giza Pyramids can be seen from the Citadel. Mosques are abundant in Cairo, as most of Egypt is primarily Muslim; the call of prayer can be heard openly and beautifully the traditional five times a day. Al-Azhar is one of Cairo’s beloved mosques, and should not be missed. This mosque was slowly developed in 975 A.D. into a university. It is still popular for the study of Islamic law, Sharia and Sunni theology. It is the second-oldest university in the world. The sheikh is considered to be the utmost highest theological authority for Egyptian Muslims. The architecture is ominous, created over a thousand years. The most photographic mosque is the Mohamed Ali Mosque recognizable by the golden-tinned domes and rounded silhouette. Sitting inside of the Citadel, the mosque is ornate and lavish, carrying the signs of the mid-19th century. The Mosque of Sultan Nasson is exquisite architecture with its bronze doors of inlaid gold and silver, marble walls and a fountain dedicated to run sherbet during celebrations. The Mosque of Aqsunqur (Blue Mosque) is famous for deep indigo and bright turquoise tiles which decorate the walls of this mosque. Formerly, a place of public execution, the Bab Zuwayla was active in 1092 AD, by crowning the heads of the guilty on public spikes. In the 15th century minarets were added the towers. The Qalawun, Al-Nasir Barquq complex is a medieval fortress of mosques, madrassas, and mausoleums built by three Mamluk sultans. Of Christian churches in Cairo, The Hanging Church 9 (al-Mu'allaqua) remains one of the oldest and largest; built in a Basilica style around the 3rd or 4th century A.D. over the southern gate of the fortress of Babylon, it is dedicated to the Virgin Mary. The Hanging Church holds as its timeless treasure, a 4th-century wall-painting of the Nativity. A 5th-century church, St. Sergius and St. Bacchus, were built over a mysterious crypt thought to be a holy family’s place of residence during their flight to Egypt. The church of St. Mercurius (Ahi Sefein) houses a unique collection of Coptic art with over 175 icons representing scenes from the Old Testament and the New Testament. This church is awe-inspiring with the vast amount of stories told through wall paintings, stained glass, and beautiful chiseled etchings. The relics of St. George in a cedar wood casket can be seen at the Convent of St. George (Plad Girgis) in the oldest part of Cairo. The chapel is reached through a rickety ratimid hallway, one of ancient beauty and history. Wander through the captivating city of Cairo, Egypt. This fantasy place is filled with endless shopping, leisure, culture and nightlife. In fact, it is after dark when the city comes most alive, when the sun has parted for the evening and temperatures are cool. The crowded sidewalks are only an adventure waiting to begin. On foot, more can be felt, and then even seen. Families lower baskets from the second floor down to the ba’al for their groceries, vendors roam with trays of fresh baladi bread and jeweled shops get livelier as evening sets in. Cairo is magic. Dance on a colorful felucca cruising down the Nile. Stop in one of the many little coffeehouses, and relax to a game of backgammon. Indulge in Egypt’s most famous dish, Koshari, sold on almost every street. This is the shopping hub of the Middle East with good buys in spices, gold and silver; carpets, jewelry; leather, and perfumes. The skyline mixes quaint minarets and palm trees into Art-Deco villas, multi-colored neons. 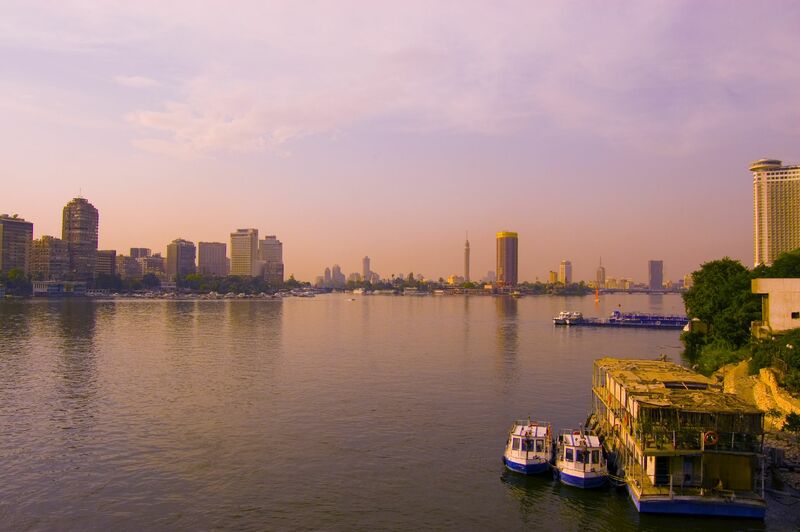 Cairo is simultaneously relaxing and exciting with the sunset melting over the Nile’s vibrant activities. Famous street markets offer a kaleidoscope of indulgent choices. Mohammed Ali Street has a wide selection of cool musical instruments. Egyptian cotton is available at Wekalet Al-Balah Street. There are Camel Markets which make for a fascinating time. Shop at the bazaars, drink fresh fruit juices, and brave the ride of a camel. Listen to the ‘call of prayer’ and listen to the people. People who are kind societies; eager to show life in bloom. Experience the mosques, and run a horse by the Giza Pyramids. Go To the top of the Cairo Tower to catch a view of the entire city in a revolving restaurant. Watch exciting horse-racing at the Gezira Club. Eat Middle Eastern cuisine in a floating restaurant located on the Nile. Listen to sultry Arabic music under the stars in Cairo’s open-air theater and be moved beyond the moment. In El Ghuriya, folk musicians and belly dancer sway magic into the air. After dark, the Giza Pyramids come alive with a Sound and Light show with music to recount the history of this solemn place. Cairo is life-changing, as history meets modernization; this is not the place that time forgot. The beauty of Cairo exists in life happening on top of life that happened so elegantly. The past is decorated and celebrated in copious architectures, food, and cultural customs. Cairo is magic. ‘The Mother of the World’ is one of the friendliest (and safest) cities in the world: Egyptian hospitality will ensure that, wherever you come from, you'll feel quite at home. "...a palimpsest, in which the Bible is written over lierodotus, and the Koran over that." Discoveries are still being made at the royal burial grounds of the Old Kingdom (2705-2155 BC). The story of the Egyptian Civilization through so many periods of time, of Pharaonic, Greek, and Roman, are layered in this historical sacred ground. The Great Sphinx of Giza lies outside of Cairo majestically and protectively along the side of the Giza Pyramids. It remains a sacred symbol of the highest intellectual power placed on Earth. Finally, The Egyptian Museum is one of the world’s most famous and fascinating museums. It houses an eccentric and historical collection of antiques which includes mummies. Also presented in this collection, are Sarcophagi and many artifacts from Tutankhamen’s tombs. Hotels are widely spread out in Cairo, it's advisable to book a room before arrival. Pick a district according to desired activities and adventures. Giza is the closest part of Cairo to the Pyramids, offering a view of the Pyramids from many hotel rooms. The Sphinx and Cairo are also located here. Mohandeseen is Cairo’s more modern suburb and it caters to the city’s professional class. There are no historic sites here, but has excellent restaurants and decent hotels. It is conveniently in between the Pyramids and Central Cairo. For the best budget accommodations, downtown Central Cairo is on mark. Tahir Square, The Egyptian Museum, Nile River and all the best shops can be found in this area. Many chain hotels offer great prices due to the congestion and noise of the city. Garden City is Cairo’s greener and wealthier district. This is where all the embassies are located. For a more hip vibe, there is always Zamalek. It is a residential district on an island in the middle of the Nile River. Many ex-pats and foreign exchange students reside here. This area has a hopping nightlife and plenty of European-style cafés. It is only a 10-minute ride by taxi to central Cairo and only 20 minutes from Giza. Since February 2015, there has been a safety issue in parts of Egypt. There have been threats to western nationals, institutions, and businesses, along with some attacks in Cairo and surrounding areas. Take great care near government buildings, and avoid roads at night or remote desert areas. Foreigners could be targeted in tourist resorts or any other locations. Protests, demonstrations, and marches are common sight across Egypt. Demonstrations usually happen on Fridays, but can occur at any time and without prior notice. Leave the area immediately, as these protests can escalate quickly. When visiting Cairo, it is important and respectful for women to be covered. Before going into any mosque, a woman must wear a headscarf; all visitors must remove their shoes before entering a mosque. Do not wear expensive jewelry on the streets. To date, Cairo has over 1,100,00 housing units, 6,200 miles of boulevards and 2,000 schools; not to mention the endless mosques and historical values of this city. Egyptian leaders hosted an economic development conference and presented detailed plans for a massive new city. The project is called “The Capital Cairo” and has been designed by American architects at Skidmore, Owings, & Merrill who have designed the One World Trade Center. Egyptian leaders have already been pledged over 12 billion USD in aid by Saudi Arabia, United Arab Emirates, and Kuwait. Mohamed Alabbar is heading up the investment fund which will finance the project; all while keeping in mind the needs of the Egyptian people and government. Egypt hopes to duplicate Dubai’s glittering urban city. The “New Cairo” project is set to happen right outside of the older city and they have expressed a desire to make it happen ‘fast’. Cairo will also be home to a new pyramid, The Zayed Crystal Spark, a 656-foot-tall glass pyramid surrounded majestically by a reflection pool. This glass tower will be the highest in the country, even eclipsing the enormous and ancient pyramids, which are incidentally only 200 feet from the site of the new pyramid. "The Nile does not change. Indeed I know of no place where everything changes as much, as it does here, and nothing is ever changed... You feel quite at home."